You want the main attachment for the fan box to be attached perpendicular to the floor, not horizontally into a faming member. The twist on a horizontal attachment could lead to failure. The box should be attached with sizable screws or lag bolts. 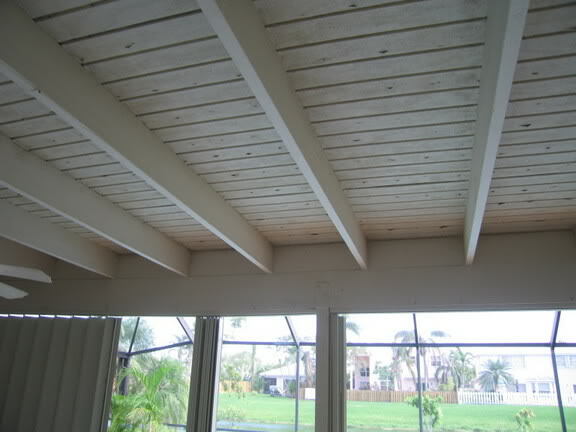 That means, you should have a framing member directly above the box, either the 2x4 you mentioned or a short added framing piece running perpendicular (vertically) to the joist. I would build a small wooden frame around the fan box. 2x or 1x pieces should do. They are not structural but decorative and gap filling. These will give a base larger than the canopy. I would then run a conduit to carry the cable to the fan box, making holes in the surrounding box trim. The picture you showed as an example has extraordinarily high ceilings, but the picture you showed of your porch looks like it does not. Also, the example fans have a gap on either side of the canopies like the one you said you want to avoid, don't they? 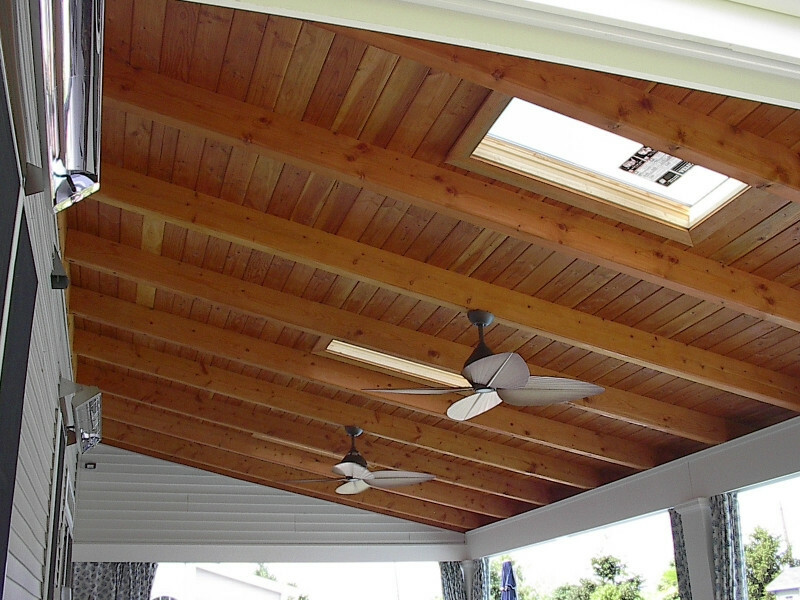 My recommendation would be to measure the diameter of the canopy for your fan, and choose a lumber size that will adequately cover it - maybe 2x6, probably 2x8. Then cut a piece that will fit between the joists, put it up between the joists, flat against the roof, and fasten it to the joists. Attach the fan box to it, right in the middle. Then cut another piece the same size, cut a hole out of the middle of it so it will fit over the fan box, making the fan box appear recessed. Then hang the fan on that. I don't think you have to worry about the box being perpendicular to the floor. Fans are made with ball joints and hangers that work on vaulted ceilings, so the fan will hang straight down anyway. Not the answer you're looking for? Browse other questions tagged ceiling-fan outdoor porch or ask your own question. How do I wire a hard-wired wall switch and a remote for my ceiling fan/light? Why do I have saw out the bar the electric box hangs on to replace it with a fan rated bar and box? Mount Ceiling Fan to Old Junction Box? How to tell if old ceiling light box can support ceiling fan? Adapting an outside wall outlet to suface mount conduit?